We are almost there!! Just a few more minutes til turkey day!!!!! If ya'll are anything like me today has been a madhouse! Between trying to get my house clean AND keep it that way, baking and cooking, and the knowledge that my kids are home for the next 5 days.....................ACKKKKKKKKKKKKKKKKKKKKKKKKKK!!!!! I did carve out a few minutes of scrappy time today so that helped a bit :) Before I sahre my layout tho I want to take a sec to thank Mrs Scrappy Frog (I don't know her real name.....lol) for thinking of me and giving me this wonderful award!! Click and go visit her blog.......she is uber talented!!! And has more children than I do!!!!! And she still appears to be quite sane!!! LOL.......Seriously, bless her heart....7 children :) God love her!! 3. I am a VERY disorganized scrapper. Even if I sit down with a sketch I have no clue what I am gonna do. takes me forever to pick a photo and then the papers, and the embellies. And my stuff is scattered everywhere. Yeah I know......the easy way out......LOL. 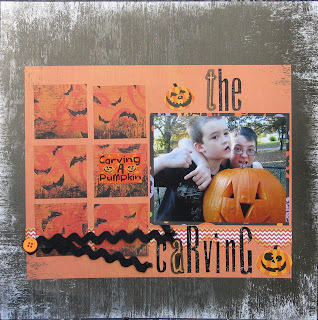 OK, Artful Delight's November Sketch!!! I just adore anything with a grid or blocked pattern....no matter what you do they turn out looking great!! Even I couldn't mess it up :) LOL! I chose to scrap one of the Halloween pix of the boys and the pumpkin. I was going for a kinda creepy title....if the kids weren't so dang cute it may have worked.....reminds me of a really bad slasher movie title.......LOL. 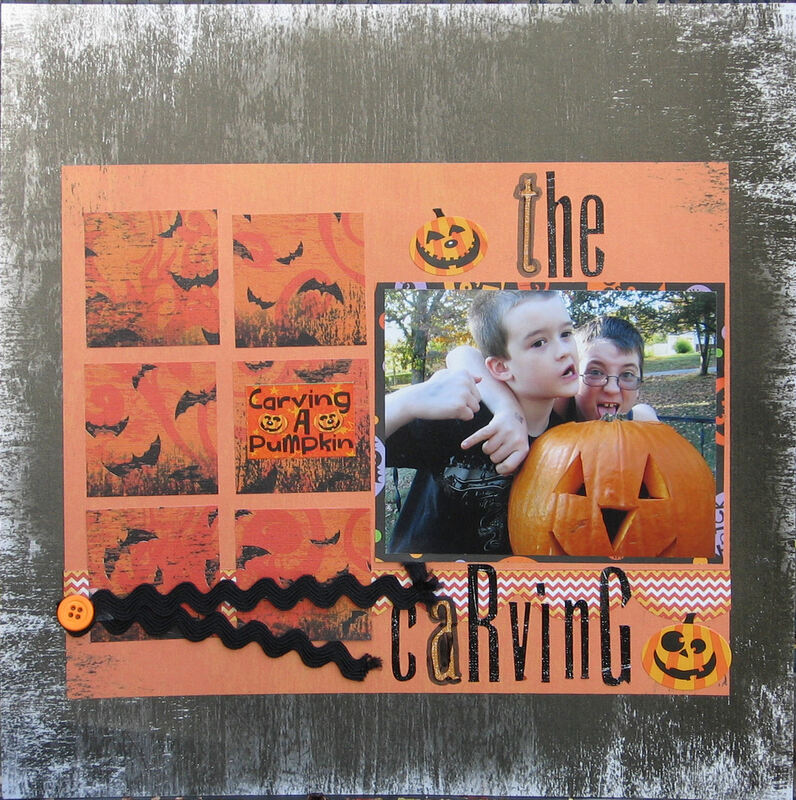 I used Papers from GCD, Sassafras Lass and Reminisce and alpha's from Rusty Pickle. I am also entering this over at Sketches in Thyme's "open" challenge for the week....which is to just create a layout using a sketch....any sketch! Way cool! And even cooler.......you can enter 3 different projects!!! I love your layout and the pic of the boys is so cute! They have their moments dont they. Don't you love a great sketch? Fun pictures of your boys to use. Thank you so much for sharing this wonderful sketch and layout with us this week at Sketches in Thyme. Great layout and interpretation of the sketch! Love the colors, and the grid design is great. Thanks for playing on Sketches In Thyme! 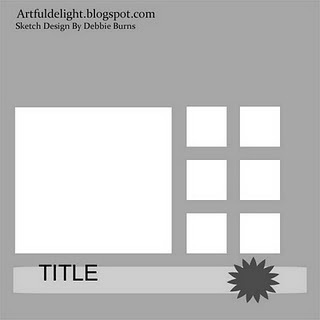 So glad you like the sketch I designed for Artful Delight! I also think it is a fun sketch! Great picture and I love the rick rack! Thanks for playing along with us at Sketches In Thyme for our first open sketch challenge! I love this!!! And Congratulations on the blog award!!! Thank you SO much for participating in the Artful Delight Sketch Challenge! LOVE it and I hope to see you play next month! great take on the sketch! love the photo of your boys. thank you for playing along with us at Sketches in Thyme! Hi Tina, it's been awhile... I think the full swing of the holiday rush is on at my house... That and babysitting!! Congratulations on the award... It's a total fit!!! LOL But then, that's why we love you soo much, gf!! Also,your layout is too cute!! Great job with the layout and I love the photo of your boys!!! Have a wonderful week!! Hugs! !